he'd stopped qualifying as a "boy" cartoonist, came from an ancient dictum in the publishing industry, that you should write what you know. Today, Mayer is remembered as the creator of Sugar & Spike, The Justice Society of America, The Black Orchid and more. But at 19, he was working for Max Gaines (who had more-or-less founded the comic book industry); and his lowly job was to slice up old newspaper comics and rearrange the panels so they'd fit on a comic book page. Gaines would then sell the package to Dell Comics, which would publish it as part of a growing line of reprint comic books. When he had a spare page or two, Mayer would insert a cartoon of his own, designed to look like the other Sunday pages, recounting the hilarious adventures of his fictional colleague. The fictional boy cartoonist first appeared in the 6th issue (July, 1936) of Popular Comics, which reprinted Smokey Stover, Winnie Winkle, Harold Teen and other Chicago Tribune Syndicate strips. A few years later, Dell was an industry giant, specializing in licensed properties from Walter Lantz, King Features Syndicate etc., and was packaging its own comics — but by that time, Gaines, Mayer and Scribbly were long gone. Gaines was running his own outfit, All-American Publications, in conjunction with a new partner, DC Comics; Mayer was editing the line for Gaines; and Scribbly was comfortably ensconced in the back pages of Gaines's flagship title, All-American Comics. He began in the very first issue, dated April, 1939. His first of a scant three All-American cover appearances was in the second issue, and he had to share it with three other characters — the least obscure of which was Hop Harrigan. Scribbly Jibbet started out as a hopeful young kid trying to break into the glamorous (to him, at least) world of cartooning — just as Mayer had not so long before. About a year into his All-American run, Scribbly got a job at The Daily Dispatch. Most of his adventures, tho, concerned the goings-on in his New York neighborhood, particularly those involving Ma Hunkel, who ran the local grocery store, and whom he first met in All-American Comics #3. At first, All-American, like most comic books of the time, consisted mainly of reprinted newspaper strips, such as Reg'lar Fellers, Skippy and Toonerville Folks. But original features soon began displacing them; and, given the trends of the time, there was a tendency for the new ones to be superheroes. Green Lantern debuted in #16, and The Atom in #19. In #20 (November, 1940), Ma Hunkel became one herself — The Red Tornado. She began sharing billing with Scribbly in #23, and gradually took over. The last appearance of the "Scribbly & The Red Tornado" series — with the latter name appearing considerably larger than Scribbly's — was in All-American #59 (July, 1944). But that wasn't quite the end of our Boy Cartoonist. Later, when the superhero fad had run its course and Archie-style teenage humor was an up-and-coming genre, he returned as the star of his own comic. 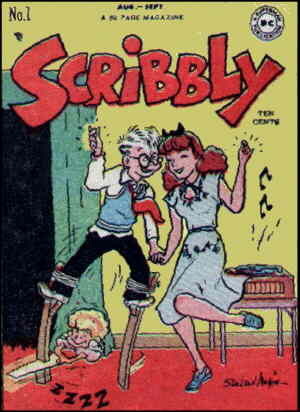 Scribbly ran 15 issues, dated Aug-Sept 1948 through Dec-Jan 1951-52. Also during that period, he appeared in the back pages of a couple of DC's other teen comics, Buzzy and Leave It to Binky. Beginning to end, Mayer both wrote and drew every Scribbly story — quite understandable, considering they were, to a certain extent, autobiographical (even Ma Hunkel was based on a real person). Mayer died in 1992, so it seems unlikely we'll be seeing Scribbly again. Text ©2001-04 Donald D. Markstein. Art © DC Comics.